Air compressors have a wide variety of both home and commercial uses. 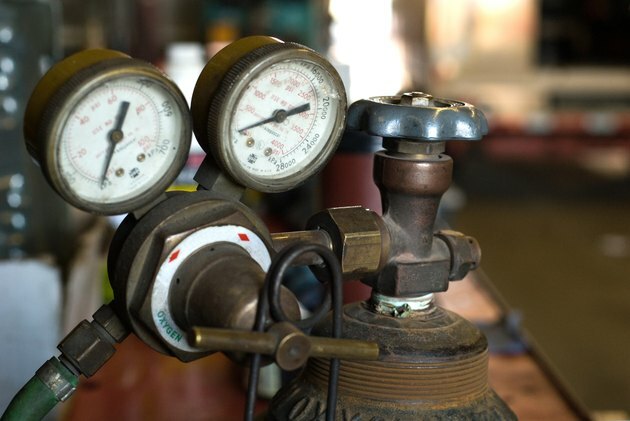 Air compressors are rated by both total psi (pounds per square inch) and cfm (cubic feet per minute) output. Cubic feet per minute, or cfm, describes how much air flow a compressor can push in a minute. Small pancake compressors may have a rating of only 2.7 cfm at 90 psi, while larger commercial compressors may have a rating of over 74 cfm at 100 psi. A compressor's cfm is generally listed as average cfm, or acfm, which means the amount of air passed at 25 percent, or the amount passed in 15 seconds of every minute. However, some tools, like sanders and shears, may require continuous flow, which would be calculated by taking the average cfm and multiplying it by four. Since there are so many different tools that are pneumatic, determining the right cfm can be difficult. But determining the type of work can help. Carpentry tools like brad nailers and framing nailers require little cfm, from 0.3 cfm to just over 2 cfm. Mechanical tools like ratchets and impact wrenches may requires as little 2.5 cfm, or as much as 5 cfm (although a large, 1-inch impact wrench requires a substantial amount of air). However, auto body tools, which are more continuous use tools, require much more air. Cut-off tools may need as little as 3 cfm, while shears may require as much as 16 cfm. LeRoy Demarest has been a professional writer since 2007. His work has been published on websites such as eHow and he has done work for "Green Prints" magazine. He is an environmental scientist and he holds a Bachelor of Science in biology from Salisbury University. How Large Will a Bromeliad Grow?